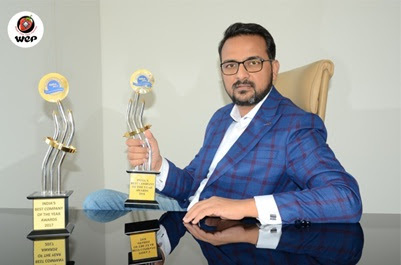 WeP Solutions Ltd, the leading solution provider of Managed Print Services (MPS), has been recognized as ‘India’s Best Company of the year by Berkshire Media, a multinational business consulting and market research firm. The India’s Best Company of the Year Awards recognizes 100 exceptional companies that have unambiguously unveiled themselves as the next set of game changers serving through their various consumer-facing businesses. WeP has claimed its excellence based on multiple parameters such as business ethics, corporate governance, workplace culture, goodwill, innovation, leadership, etc. WeP has undergone a rigorous research to stand out of Corporate World/Fortune Companies. With a spotlight on innovation and creating a satisfied customer base, WeP has invested heavily in Indian market and is celebrating the success of being one amongst the fastest growing companies. “I am thankful to my entire WeP team for their continuous support and also all the internal and external stakeholders who are directly or indirectly involved in our successful journey so far,” Mr. Garg added. “India’s Best Company of the Year Awards are one of the most credible business awards in India,” says Mr. Vijay Shivtare, Hon’ble Minister of State for Parliamentary Affairs – Maharashtra Government. WeP caters innovative printing services to multiple industries like Education, BFSI, Manufacturing, Healthcare, IT, etc. With over 18 years of expertise in printing, managing and supporting imaging devices, WeP is serving over 500 customers and have presence across 2000 locations in India. Additionally, WeP is making strong inroads into various segments like Retail Printing Solutions, Printing Automation & Device Management. It remains the most preferred brand for impact printers among all industry verticals.